Getting dentures is frequently a serious lifestyle change for those who have never had them. In addition to adjusting to a dental artifice that is not actually your natural teeth, and learning to chew and speak normally with them, you will also have other considerations. Among these is the issue of ensuring the proper fit of your dentures. Dentures that do not fit well can lead to a number of issues, none of which are pleasant. Probably the most significant issue is the pain that can result when your dentures don't fit you properly. 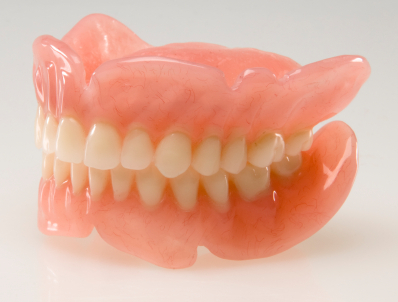 Dentures that are the wrong size can rub against your teeth and gum tissue. This in turn can lead to sore spots or even open wounds depending on the severity of the issue. Another common problem with improperly fitting dentures is the hygiene and cleanliness issues that can result. As a matter of fact, dentures that do not fit your mouth perfectly may create small pockets between your gum tissue and the denture surface. Food particles, bacteria, and other things can collect in these pockets. In turn, these pockets, then become breeding grounds for some pretty nasty things, and the result can range from halitosis (also known as "bad breath") to infections and other health complications. With these-and other-common issues, you can see why it is important to make sure that your dentures fit you properly. If you have questions or concerns, we are happy to spend some time with you reviewing your dentures and making sure that they properly adhere to your gum tissues. You do not have to live with improperly fitted dentures. We are here to help you, so please contact our office today.